The best way to search for a missing hedgehog is to explore an area on your hands and knees. Look for warm dark places where a hedgehog is likely to hide. Be sure to look in, under, and behind appliances such as the stove and refrigerator. Refrigerators are very popular because they are warm. Couches and recliners are dangerous because an unassuming person can sit on one and squish poor hedgehog. They might find holes in walls and flooring, or squeeze through ducts and drains. 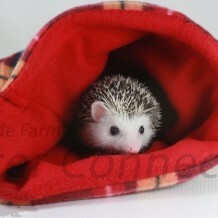 Heather Johnson at www.hedgies.com suggests putting food, water, and treats in a brown paper bag. When a missing hedgehog searches for a meal, you will hear the bag rustle. Familiar sleeping bags or other objects might also attract a missing hedgehog. Remember that hedgehogs are nocturnal, so a good time to find them on the move is to search in the dark with a flashlight. Start your search for a missing hedgehog along the outside wall. Hedgehogs are likely to search along the wall for both a place to hide and tasty insects. Check any clothing left on the floor for your quilly friend, especially before putting it in the wash! Try not to move any heavy objects, which could injure your hedgehog – instead try looking behind large furniture with a flashlight. If you cannot find your hedgehog within a few hours, consider the temperature in your house and whether your hedgehog is likely to get cold. Winter months, air conditioning, a cold tile floor, or even sleeping up against an outside wall could all encourage your hedgehog to attempt hibernation. Turn up the heat, but please make sure that a hedgehog is not hiding behind or in the heat source before you crank it up! If you keep any pest control products on the floor (roach/ant bait, mouse traps, etc), you will want to make sure these are all picked up off of the floor until your hedgehog is found! I was spending time with our hedgehogs and left the carrying pouch open and went out of the room yesterday for a quick trip out of the room. I came back to an empty pouch. We have searched everywhere and turned over all furniture. We even brought the cats and dogs in to see it they would sniff her out but we can’t find her. Do you have any suggestions? I am so worried she will die of dehydration before we find her. Thank you for the article. I tried all their suggestions. We crawled around the entire house with flashlights a few times and tried setting food and water out and her sleeping bag. Nothing seems to work. If you have any other suggestions, please let me know. Do you think I should worry about her sister being lonely now? They are very sneaky and I can understand how worried you are. Multiple “traps” are important because you don’t know for sure where she is hiding. Put food and water near warm places such as appliances etc., furniture etc. The generally move along the walls so those are the best spots. It may also help to sprinkle flour in front of the bags or along the wall. It will make a mess but it will show little footprints and give you a clue where she is hiding. Keep in mind that she can go down stairs, possibly climb stairs and may go into other rooms. Again, lots of traps may be needed. You can count the number pieces of kibble in the bowls so that you can tell if she is eating. Turning the lights off will generally help them come out at night, especially if they smell the food. Sometimes if you sit and listen in the living room and check dark rooms you can hear missing hedgehogs crunch their food. Keep an eye on your other female. Make sure she is eating and drinking normally and give her plenty of attention. Update: 12 Days Lost. We still haven’t found her. I followed your advice and have had little footprints in the flour every night except one night. But she isn’t sleeping in the warm areas I made for her. I also left her wheel out a couple times and it has remained very clean so I am assuming she isn’t using it and that is something she used to use every night so I thought it would entice her. I’m not sure what else to do. I have continued to look. It is very strange because my living room is very uncluttered. There is not alot of places for her to hide but I know she has to be in there because it is closed off at night. UPDATE: 16 Days Lost. We found her!!!! My husband heard scratching under the entertainment center and we found a hole in the back that she was able to get into. She seems fine and healthy. She ate as soon as we put her in the cage.